Includes the MyBizIQ Quick Start Books 1, 2, 3, and 4, a live MasterMind Session and Simple Strategic Plan! This is your custom produced analysis, evaluation, and step by step recommendation for turning YOUR business into a gold mine. GUARANTEED. Best Economy in History... More Millionaires and Billionaires Will Be Created Than Ever Before... Why Not You? Why Not Now? We are not bragging. We are applying for a job to become your Master Business Strategist. We are very easy to work with, but if you do not like what we say, do, or anything about this program, we will simply refund your money in full and part ways. Life is too short to do otherwise! These books are all custom-produced using the responses to your Biz IQ tests, and stated business objectives. There are literally millions of combinations and permutations considered, so the results are highly specific to YOUR business. We invite you to ask each member of your leadership team to submit their own views about the business. That way, you not only get a 360 degree assessment of your business processes, but an honest, well-grounded, and objective series of talking points that will point the way to lasting change and considerable improvement. Normally $699.95, this incredible package is on sale now for just $97. Perfect for every member of your leadership team, board members and trusted advisors. Each order will include a certificate for attending our Monthly Master Mind Business Roundtable TeleSeminars for the next 12 months — a $1,200 value with your Midas Touch Bundle! In a "Survival of the Smartest" hyper-competitive global economy, you and your entire team needs to out-think... out-hustle... out-produce and out-perform the competition at every step. To do this, get with the program! While the Full MyBizIQ System represents the best value, Planning to WIN is ideal for people who just want their custom-produced, 300 page Strategic Plan... and have the skills to implement it on their own. To get you going, it includes a 1 hour, one-on-one consultation with your MyBizIQ Accountability Mentor. Limited Time Only: Order The Midas Touch Bundle: Planning to WIN for just $97. 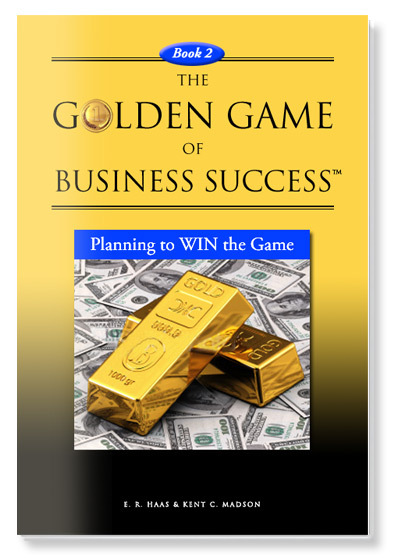 Books 1 and 2 of the Golden Game of Business Success Series are custom-produced, with some 300 pages of personalized, specific analysis, evaluation and advice — all written specifically for you. This is the single most UNIQUE document of its kind in the world today. It gives you dozens of specific charts and graphs and a truly hard-ball analysis of your businesses STRENGTHS and WEAKNESSES. It puts real power at your fingertips — everything all in one place — to help you decide exactly who is going to do what and why... to grow your business to Stage-4 Greatness. Total Value: $6,000 to $50,000. Your CPA would probably render these services for $10-20,000 if they had the tools. Get the System, show it to him or her and ask what they would charge for these tools... if they even had them to offer. A Picture is Worth 10,000 Words — and $5 Grand in savings! This simple "cheat sheet" explains why the MyBizIQ System is BETTER than spending $5-10,000 on a consultant. This PDF should open in a new window. If not, right click and save linked file to your drive and open/print/review from there. Click Above Benefits Button to learn more. Click Above Options Button to see additional programs that may help you. A 100% Money Back RESULTS Guarantee. We either help you or don't expect to be paid. Develop the business SAVVY of a Harvard MBA... the crystal-clear VISION of The Oracle of Omaha... and the penchant for ACTION that trumps "The Donald." The single biggest benefit of the Golden Game of Business Success Series is that it instantly — yes, instantly — boosts your Business Intelligence by a good 80 points. Just by taking the Stress Test, you are instantly smarter about business. By completing the Master Test, you gain a powerful competitive edge... because you can now see SPECIFIC areas of your business you can instantly improve. The single biggest BENEFIT of the MyBizIQ System is that is gives you the tools, technology and training you need to make your business work better... right from the get-go. You will look at your business differently. You will see opportunity differently. You will SEE — maybe for the first time ever — you business in a whole new light. The Golden Game of Business Success Series is for people who know they can do better... want to do better... but have no clue what they need to do differently to turn their business into a real gold mine. It is perfect for self-starters who only need a little push in the right direction from time to time. Once you have started your business transformation, you may be eligible for TQ Biz IQ Coaching/Consulting. You will be kept in the loop monthly so you can tap into this vital personal resource. You love to be among positive, enthusiastic and proactive decision makers... rather than hanging with the "no it all's"... no, we can't raise sales... no, we can't increase growth... no, we can't improve profitability. Bull. We have always been the world leader in virtual training products for personal and professional excellence. Our 25 years of real-world experience... with customers in every country in the world... has given us the systems, people and technology to DO something that others can only TALK about: Instantly Improve your Business IQ. By using our exclusive "Teaching Through Testing" system, we can pinpoint EXACTLY where you need help... and get you that help at the click of a button. You take the first step when you take the MyBizIQ Stress Test. Regardless of how you score, the big "take away" from this is that you either need HELP or you don't. If you do, it's time to order the Midas Touch Bundle. Our philosophy is simple. YOU supply the hard work, dedication and passion. WE supply the tools, technology and systems to help you turn your business into a gold mine. If you want to transform your business into all that it can be, get with the program. It's a unique new resource to help small to medium sized businesses eliminate what's holding them back from achieving Entrepreneurial Greatness. Put simply, MyBizIQ.com is the SMARTEST site on the net with a single focus: To give you The "Midas Touch!"